The Syrian refugee crisis is perhaps one of the most pressing human rights issues of our time. Each year thousands of Syrians flee the country due to an oppressive regime and ceaseless violence. One issue that’s a symptom of mass migration that often gets overlooked is the fact that this leaves hundreds of animals homeless. 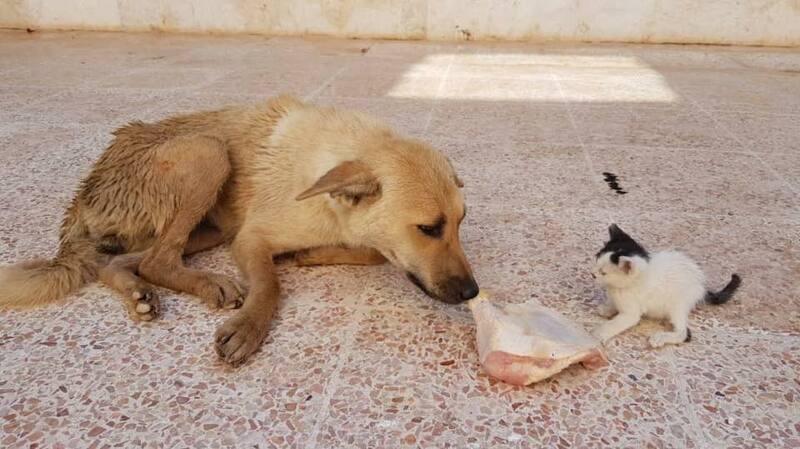 Seeing this problem, a man named Mohammad Alaa Jaleel started taking in strays. After a while, though, this became too much for him to handle and he knew he had to take it outside of his home. 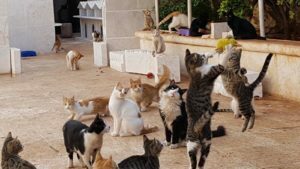 That’s why he founded a shelter called Il Gattaro d’Aleppo, which primarily houses cats. 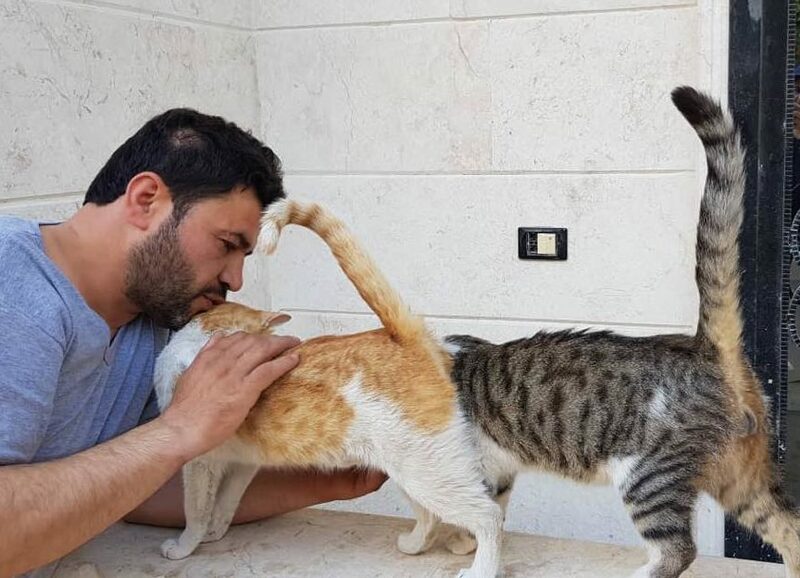 He built quite a reputation for himself and when people fled, they started bringing their cats to Mohammad so that they’d be cared for. But his kindness doesn’t stop with his feline friends. 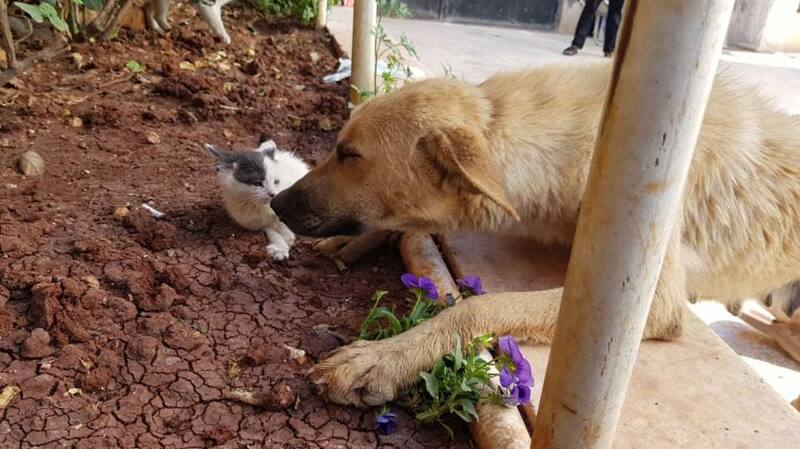 One day, he came across a pregnant dog and decided to take her in so that she could give birth in a comfortable environment. 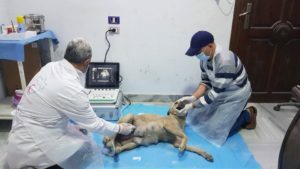 Heartbreakingly, however, the dog’s three babies were all stillborn. 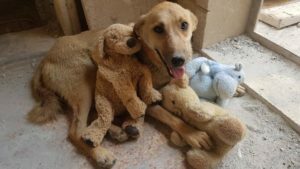 Alessandra Abidin, a volunteer, saw in her eyes that she was heartbroken, so she brought the grieving pup a few stuffed animals to help ease her pain. 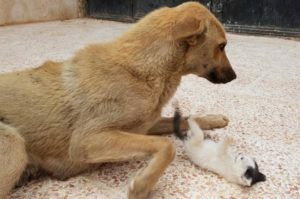 But everything was about to change for this pooch, later named Amira. She met a tiny kitten named Junior and sparks instantly flew. 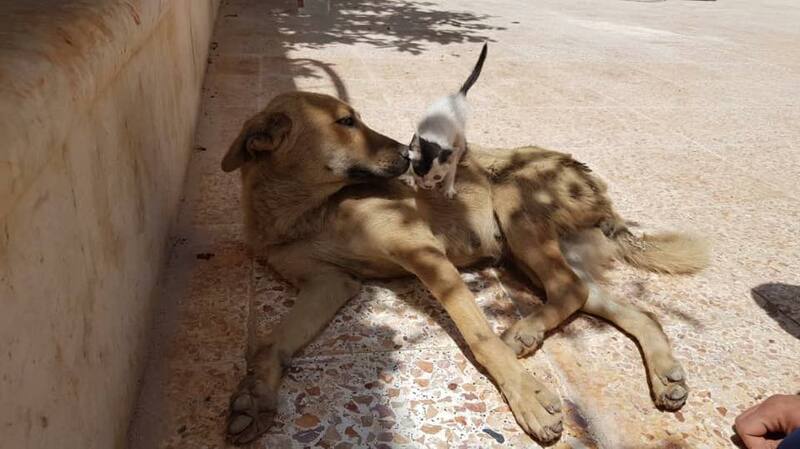 Over time, Amira became Junior’s BFF and eventually, his foster mom. Her maternal instincts kicked in right away. All day long, they love to play and snuggle. It’s clear that they’re both getting what they need from each other. Amira doesn’t mind that Junior is a little rambunctious. In fact, she seems to have fun with the active kitty! It’s amazing how people (and animals) can come into each other’s lives right when they need them most. If their story warmed your heart, be sure to share it with your friends!